Okay. I heard you; thank you, Lord, for the great idea! Since a lot of you have no idea what I am posting on my Facebook page, I’m going to add my Tammy Tangent Tuesdays to my blog in addition to the weekly reflections. We’re all in this together, so let’s embrace these challenges with a cheerful heart (Proverbs 17:22). These challenges are to stimulate and encourage each other to give back to the community and bring unity by tapping into that beautiful spirit that resides within you, that Beautiful YOU, while pouring into each other. It’s inexpensive, oftentimes will be free, and encourages you to step outside of your comfort zone and share that BEAUTY that resides within Beautiful You! Find that neighbor that you don’t know and drop them off on their porch, give them to your pharmacist, a nurse, or the checker in any retail establishment, or how about the waitress that serves you. Trust me, you will be amazed at the reactions to what people say and do. Flowers bring smiles; and that smile will be transposed on others naturally and it will bring joy to a dark world. Come on, let’s spread the love of Jesus to a world that needs a bright spot. Share this post on your FB page and let’s get this started. Every time you receive a bunch of flowers, take one flower and give it to someone else. I would love to hear how this simple token of love is brightening up others’ lives! Embrace that beauty within you and let it shine! 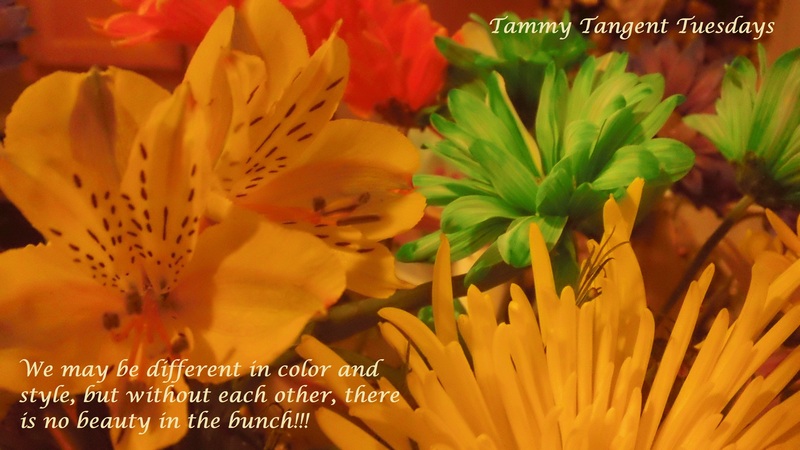 Remember, we may be different in color and style, but without each other, there is no beauty in the bunch!! !